Glenn became a science and mathematics teacher because of his curiosity in the way the world works and his desire to give others the freedom to explore it. 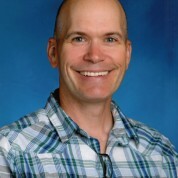 Therefore the key aspect of his teaching style at Centre Wellington District High School in Fergus, Ontario consists of student-centred learning. He aims to engage students within a fun, cooperative learning environment, providing lessons that advance students’ thinking and promote positive social interactions with their peers. In his health-care courses students get hands-on practice in first aid and infection control, and they benefit from discussions with leading experts from fields such as mental health, nutrition and drug manufacturing. Glenn has pioneered a social media innovation called Knowledge Building – an online learning environment where collaboration and structured debate occurs around questions and ideas generated by the students. The Ministry of Education has recently included this approach in the Ontario curriculum. Glenn enjoys sharing this knowledge with other teachers and to date has developed a series of over thirty workshops and presentations for educators. He also publishes articles on innovative practices in science teaching in peer-reviewed international journals. He has received eight teaching awards and scholarships, such as the AMGEN Canada Award for Science Teaching Excellence and the Canadian Association of Physicists Excellence in Teaching Award.